Renting a car in Malta is one of the best deals you can make during your stay. The “big” island, Malta, is only about 17.5 miles long (28 km) and 9 miles (14 km) wide and it would be a shame not to know most of its beautiful villages, historical sites or landscapes, inland or on the Maltese sea shore. When you rent a car in the main island Malta, you can also drive to the Northwest and take the ferry to Gozo in the Cirkewwa Ferry Terminal. The second biggest island of this fantastic mediterranean country is even smaller, 9 miles long (14.5 km) and 4.5 miles (7 km) wide, but it’s well worth the visit, specially if you spend one day driving around places like the capital Victoria (or Rabat) and its Citadel, churches and the isolated sanctuary Ta’ Pinu, and many more small villages or hidden beaches and bays. Driving in Malta is also a great experience and an adventure for those who want to try driving on the left side of the road. Don’t worry, in ten minutes you will feel like you had been doing it all your life because it’s very safe to drive on the roads of Malta, since there is almost any traffic, except near the capital Valletta and in the major maltese resorts in the north. So, when you visit Malta, rent a car for 2/3 days and discover the islands by yourself. Find the best deals before leaving home and pick up your car at the airport or your hotel. Let the adventure begin! To rent a car in Malta is probably one of the greatest adventures you can have on the islands. Renting a car in Malta is cheap and the mobility you get is really worth it. Being small islands, you can get anywhere fast and both the most visited places and the off the beaten track secrets are just half an hour away. Since there are many hotels in Malta where you could stay, it’s better that you decide your own route. In Malta, it’s really difficult to get lost because, sooner or later, you will find the sea. So, don’t worry too much about it. But it’s always a good idea to buy a Malta Guide with a road map. Malta is a drive on the left country. If you’re not used to it, be careful at first but you’ll get accustomed faster than you think. Traffic is usually not a problem in Malta but you will want to avoid rush hour near Valletta and on the road to the airport. Most roads are in good conditions. Drive safely. Most of the best destinations in Malta are in the centre, northeast or southeast of the main island, in a 5 mile radius (8 km). This doesn’t seem much but it’s almost impossible to visit all the places in a short time using public transportation.Take, at least, 2 days to visit Malta’s main island using the following map of Malta as a guideline. Many placemarks you find there have a link to another page of this Malta Travel Guide. If you stay enough time in Malta, you absolutely have to visit the whole archipelago. 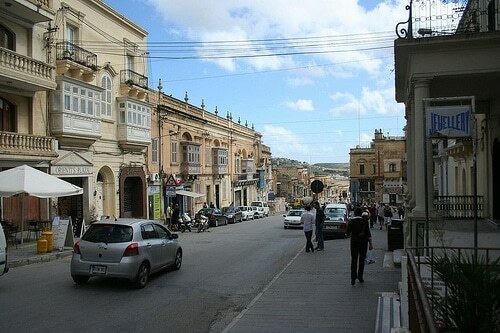 Take your rented car on the ferry to Gozo and go sightseeing 1 day in Gozo Island.